It’s a time for words. Many words. But mine are not coming. At least, the motivation to put them down is not. It’s been a busy year, full of activism, new jobs, moving, and marriage. It’s been a year of first protests and first holidays as a married couple. It’s been a year of participating in life in wild and wonderful ways, and learning to be myself. And part of that learning and participation has been letting go of the writing and the blog. At least for now. At least until I remember why I write, not so I can produce something to simply be consumed, but to get myself out there and share my “Me toos” with the world. I will return after the holidays. I’m not sure if I will share weekly updates or what my new rhythm will be, but I will return with stories to share. I hope to see y’all when I do! Let me begin the second entry of my Lenten reading series by claiming my own privileges and biases: I am a white female coming to terms with my own complicity in an unjust system which values people like me above black Americans. As such, I am writing these reflections for people who want to become more aware of the injustices in our nation, who want to be good allies, and are doing what they can to nudge those in power and privilege into solidarity and action with the oppressed and marginalized. It’s often said fiction is the best way to understand difficult issues. 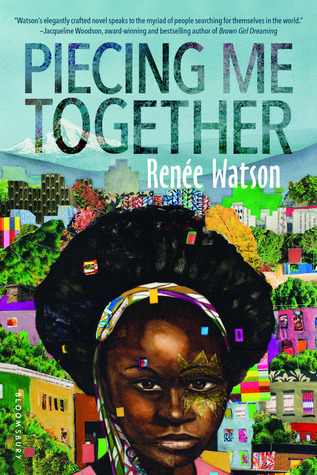 I especially agree with this sentiment in regards to Piecing Me Together by Renee Watson, a young adult novel about Jade, a young woman who “believes she must get out of her poor neighborhood if she’s ever going to succeed.” As such, her mother pushes her to take up every single “opportunity” possible: attending a mostly white private school far from her friends, tutoring students in Spanish after school, and the Woman to Woman mentor program. This last one is quite unwelcome, and a major theme of the book is the relationship she develops with her mentor Maxine, who is black and went to the same private school Jade attends, but seems to have trouble understanding Jade’s own reality. Jade also navigates a friendship with her white classmate Sam, while also managing her relationships with her hard-working mother, her loving father, her best friend Lee Lee, and others. She is also a budding collage artist, and she is most expressive in the act of taking ordinary items and piecing them into something beautiful and whole. I coordinated a mentoring program, Sister2Sister, for 2 years after I graduated from college, which worked with girls from predominantly Latino and African American communities. I have also been a mentor with Big Brothers Big Sisters since 2008, and my Little is Latina. My experience has given me the privilege to be in relationship with girls from different ethnic, racial, and social backgrounds from my own, and in the midst of joy and connection, many accidental faux-pas occurred due to my own white privilege and bias. I received a lot of grace from other mentors, leaders, professors, and the girls themselves in acknowledging and properly dealing with my privilege and biases, but I still have a lot to learn, as I did then. Jade’s interactions with her mentor Maxine, and her white friend Sam, taught me a lot about the flaws in my own good intentions and how those aren’t always enough. I also learned forgiveness and repentance are possible when allies and mentors alike are willing to acknowledge their own complicity, accidental or otherwise, in a white supremacist system. Most of all, I heard a young woman’s passion, one which broke through despite the world attempting to break and silence her, through overt and hidden racism, through savior complexes, through flat-out ignorance, and through her own conditions. Through Jade’s story, Renee Watson reminded me of the power of truly hearing someone’s story as told by them. So if you’re looking to understand a piece of the contemporary black narrative, please read this story of a strong, intelligent, articulate, creative black young woman coming to terms with the world around her and how she will live into it. It changed me. I’m sure it will change you, too. Let me begin the first entry of my Lenten reading series by claiming my own privileges and biases: I am a white female coming to terms with my own complicity in an unjust system which values people like me above black Americans. As such, I am writing these reflections for people who want to become more aware of the injustices in our nation, who want to be good allies, and are doing what they can to nudge those in power and privilege into solidarity and action with the oppressed and marginalized. As part of my #BlackLivesMatter reading list, I read The New Jim Crow by Michelle Alexander. To describe it as eye-opening is an understatement. I knew there was underlying racism in our prison and criminal justice systems, but I didn’t know how it could happen. Like many other white Americans, my education conditioned me to believe racism in America is dead and gone. I’m still dealing with those biases, and Alexander’s thorough work brought the stories and statistics long hidden in the dark into the bright light of day. Alexander’s thesis is this: the current mass incarceration of black Americans in the United States acts as a new system of control reminiscent of Jim Crow society. She begins by explaining the relationships between black slaves and white indentured servants early in American history. Since the indentured servants and slaves otherwise occupied the same class and social ranks, they collaborated together against the white land owners for whom they worked and fought side by side in rebellions. To prevent further collaborations, the white land owners pushed an agenda of white supremacy, which caused a cease in interracial collaborations. Alexander then goes into detail about emancipation, the failure of Reconstruction, and the rise and “downfall” of the Jim Crow laws, setting up the stage for the start of the War on Drugs and the mass incarceration of black Americans which followed. Alexander compares this mass incarceration of black men for drug use the “New Jim Crow” because of the permanent and legal revoking of the rights of incarcerated citizens upon receiving a felony conviction. Revoked rights include the right to vote, access to government assistance, and securing a job, similar losses black Americans legally sustained during the Jim Crow era. Unfortunately, few are able to push back against these losses, because so many legal cases have supported a “colorblind” criminal justice system, and racism is only seen as a matter of intention instead of a subtle, systematic issue. This is because the only ones deemed racists today are the KKK and people who act in outright ways to show hatred and hostility to black Americans. Subtle, even unintentional and everyday, acts of racism are not regarded as racist, because they are “unintended” and, to some, invisible. This is an excellent and important read, because to those unaware, Alexander provides insight into the racist (intentional or otherwise) structure of our legal and prison system. When a disproportionate amount of black people are imprisoned for drug crimes committed at an equal/greater rate by white people, something in need of confrontation and change is lurking below the surface. The problem is not guilty people being imprisoned for drug use. The problem is the obvious racial biases inherent in the War on Drugs, which result in the targeting of black Americans and black communities at a rate disproportionate to Americans involved in drug crimes. The problem is mandatory minimum sentencing laws which require any person charged with any type of possession to be sentenced from five years to a decade or more in prison. The problem is the inability to be able to plea anything other than guilty, even when innocent, because of biases surrounding race and lack of financial and legal assistance. This is a human rights issue, and unfortunately, because these human beings are labeled criminals and felons, few seem willing to rush to their defense. However, if we claim to be a just and equal society, we must stand up for all Americans, and the incarcerated are our citizens. If we claim to be Christians who follow Jesus, who is found with the imprisoned, we must advocate for their full inclusion in the world as children of God. The stories, facts, and questions Alexander raises can increase awareness around the nation and push activists, new and seasoned alike, to confront the injustices occurring in a system called to uphold the law. Alexander, who wrote this book seven years ago and before the Black Lives Matter movement officially began, calls the activist community to cease ignoring this issue. Her advice and wisdom seem all the more appropriate and timely now. The insights from Alexander’s work can also begin the long overdue conversations about race which honor the voices of black Americans, those incarcerated and free, and white voices affected by crippling poverty. They can push white people to confront their own biases, intentional or otherwise. As people shaped in a society in which most of the power is held my white people, racial biases are inevitable, and we must confront, acknowledge, and deal with them, or else we refuse to heal and be good allies to our black brothers and sisters. To become involved in the fight for prison and criminal justice reform, check out The Sentencing Project, NAACP – Criminal Justice, and/or FAMM – Families Against Mandatory Minimums. The Hollywood International Airport in Fort Lauderdale is a sacred place for me. It’s where I felt my father’s embrace for the first time in 16 years. It’s where I met my sisters and stepmother for the first time ever. It’s where I first discovered and felt the love and joy of this new family of mine. And, like many other beautiful, sacred places, this airport has become a place of innocent bloodshed. This past Friday, January 6th, a man opened fire and killed 5 travelers and injured 6 more. They all had their own stories, too. The travelers had their own joyous reasons to be in this sacred place. They had their own families and loved ones to meet and spend time with. Even the man who pulled the trigger has his own stories, of joy and sorrow and pain that culminated into this violent moment. This post does not serve the purpose of facilitating discussion around guns and mental illness. This is me mourning the further loss of life at a place that holds so much meaning for me and so many others who see this airport as a sacred place of reunion, love, and joy. I, like the families and loved ones of these victims, cannot walk across the terminals and pick up my luggage without remembering that innocent blood has been spilled there. When I go to hug my father, stepmother, and siblings again, I will know there are people who will never again hold some of their loved ones in this same embrace. When I walk with my family to the parking garage to make the drive home, I will remember that for 5 people, the baggage claim, not the homes of loved ones or resorts of joy and memories, was their unintended final destination. And that is heartbreaking. And it is worth mourning. It is a sacred duty to remember, mourn, and prevent the loss of sacred lives wherever we go. So when I return to Hollywood International Airport again, I will mourn. I will pray. I will love my family fiercely. I will do what I can, where I am now, to make sure there are fewer victims of senseless violence, and I will do what I can to make sure those perpetrators are prevented from doing this damage in the first place. This involves caring for them, too, and that will be hard, difficult work, and it needs to be done. I don’t know how I will, but I hope that the act of being with my family and walking across those holy, devastating spaces will both remind me of what has been lost and give me the courage to do something that will bring more love and less hate into this world. Which one will we be today, friends? I hope you’ll continue to check in throughout the week and share the posts with anyone you think would be interested in your topics. Also, if you want to see anything specific covered within the range of these themes, please let me know in the comments section on the blog or here! I appreciate all of your support and want your voices to be heard! When did God become smaller? At what time did the God who wrestled Jacob become unable to deal with our questions and doubts? Or when did the God who came to Job in a whirlwind and affirm his questions become impatient with our cries for justice and deeper understanding? I read about the God who promised the Israelites a return from exile yet told them to seek the peace of their captive city. But when did this God get replaced with one who told us nothing bad will ever happen to us as long as we do everything right? When did the God who spoke more truth through “unworthy” foreign sailors than God’s own prophet Jonah suddenly become unable to speak any truth through anyone besides Christians, and only “proper Christians” at that? When did the God who, embodied in Jesus, called us to care for the vulnerable populations and affirm the divine image of God in them, change his mind and tell us to demonize them? When did the God who transformed Paul from murderer to evangelist become unable to do the same for other murderers and offenders? When did the God who instituted the Church, against which the gates of hell would not prevail, decide the Church could be destroyed by science and postmodernism? Maybe, you say, God is not smaller but my faith is. Maybe you tell me the questions and challenges I pose are wrong, and it’s not these understandings of God which are in the wrong but me. But still I ask you, if God is not smaller, then why can’t my questions and even my small faith be handled? Why do I hear so much about a God who only cares about us achieving some vague, other-worldly idea of holiness instead of doing justice, loving mercy, and walking humbly with our Creator? If you say God’s love is not small, why does the criteria for inclusion in God’s family resemble that of a country club instead of an AA meeting? Every now and then, I find proof of God’s bigness. I catch glimpses in communities who live out God’s desire for mercy, not sacrifice; when someone deemed “unworthy” is welcomed in with open arms, and when people are free to ask and wrestle with questions instead of receiving cookie cutter answers. I see great signs of God’s presence in the theater, where hard stories are told and embodied with unflinching honesty and difficult questions are pondered over meals, drinks, and laughter, where playtime is a way of life. But more often than not, I still see God shrink-wrapped and forced into a box, another easy product to be consumed. Sometimes, it seems like God has been forced into multiple boxes, as if God has been dismembered for easy shipping purposes.When I see this, I fear God will never be able to be big again. And then I remember how God is capable of raising people from the grave, so I don’t put too much hope in that method.